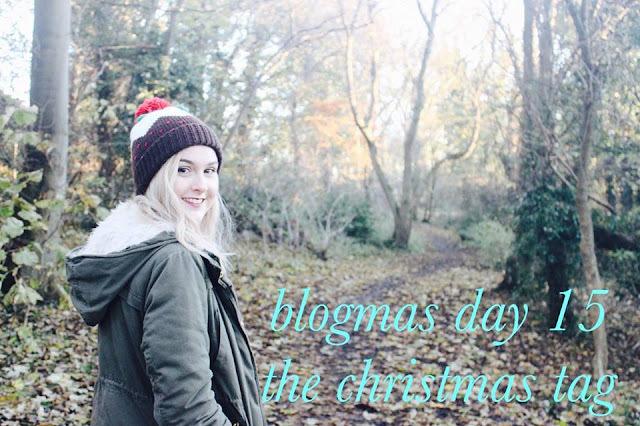 Welcome to Blogmas day 15! I’ve got a Christmas tag for you today, taken from MAKEUPSAVVY‘s blog. Enjoy! Definitely The Santa Clause. I have all 3 movies on DVD and watch them multiple times at this time of year. I actually wrote a post about my favourite Christmas movies which you can read HERE! Christmas morning! If my dad had his own way we’d open them all on Christmas Eve, but I can’t even imagine that. Without the opening presents next to the Christmas tree, it wouldn’t really be Christmas. The only Christmas memory I have is of me being sick and unable to open my Christmas presents. Not exactly a favourite, but it’s the only one I’ve got! Other memories include playing board games with the whole family, which always ends in arguments but it’s good fun all the same. Turkey turkey turkey! I must admit, I’m not a fan of pigs in blankets. Sorry! I could eat all the turkey on Christmas though, it’s my favourite food but I rarely have it throughout the year because I like to save it for Christmas. I always ask for seconds and eat so much that I can’t move. I love all the gifts I get, but if I had to pick one it would be a massive Disney Princess castle that I got when I was little. Literally every little girls dream. I love them all. I like spiced apple, cinnamon and all the Yankee Candles named stuff like ‘Christmas Eve’ and ‘Christmas Memories’. I wish it was acceptable to burn Christmas candles all year round because they are honestly my favourite scents of them all. My mum makes us these Christmas Eve boxes – usually with pyjamas, a lame tshirt, chocolate and a magazine. She’s even started making one for my boyfriend which is super cute. We all gather in the living room and open our boxes whilst watching Christmas films and it’s my favourite tradition ever. An angel! The angel is kept in my room all year until it’s time for her to go up onto the tree. I wrote about decorating our Christmas tree this year which you can read about HERE! Nothing comes to mind really, I hate asking for things at Christmas so I always try to pick things that aren’t too expensive or impractical. I think I’ve asked for one thing this year – I just always feel so guilty asking for lots of expensive things. The family time. It’s the one time of year when the arguments aren’t so bad, and it’s really nice having the extended family over for a little while as well. 11. Be honest: do you like giving gifts or receiving gifts better? Giving! I think everyone loves receiving gifts and if you say you don’t you’re probably lying, but I just love the look on the person’s face when you really nail it and get them an amazing gift. I love to spoil my boyfriend, it’s just a shame that my bank account doesn’t feel the same. If anyone wants to give this tag a try, I’ll leave the questions below! I tag anyone who wants to give it a go, let me know if you do it, I’d love to read them!